The bread and butter of the DGI strategy are the raises you receive over time. Dividends itself are a great way to earn some money, but increasing dividends are amazing. Especially if you consider the effort you have to put in, to get those raises: none! My blog is only 13 months old and I have had the pleasure of receiving several raises. This month is no exception. On June 9th, TGT increased their quarterly dividend from $0.52 to $0.56. This is a 7.69% increase! I wish my employer would give me the same.. This increases my YOC from 3.55% to 3.82%. On July 15th, KMI increased their quarterly dividend from $0.48 to $0.49. This is a 1.85% increase. One penny doesn't seem to be much, but every penny counts! This increases my YOC from 5.52% to 5.63%. Also on July 15th, OHI declared a $0.55 dividend. This is also a 1.85% increase. This increases my YOC from 6.09% to 6.20%. Pretty nice YOC's if you'd ask me. Definitely happy with that. Did you receive any raises recently? Recently, I put some fresh capital to work! Kinder Morgan Inc is the fourth largest energy company in the US. They transport and store petroleum on a very large scale. From an investor point of view, this is one of the few non-Aristocrats I added to the portfolio. Their current dividend increasing streak is only 4 years, but according to David Fish' CCC list, they are a former Contender. We have seen recent declines in all Energy related stocks. CVX, down 16% since I bought it, last September. HP, down 45% in the same period. This does not worry me at all. We cannot time the market and we have to treat it as opportunities to average down. I will definitely try to do so with CVX, if their decline continues. On the bright side: my yield on cost on this KMI purchase starts at an amazing 5.52%. Theres more good news, as KMI could transfer and store other products as well. For example natural gas. This should maintain a very nice income stream in the future. The yield of 5.00% is below the sector average of 5.45%, but I'd take a 5% yield any day. What do you think of this purchase? Here's a short breakdown of the purchases I made. T. RowePrice is a global investment management firm. They manage US and international stocks, mutual funds, blended assets and bonds. Main reason for buying this stock is their strong growth over the last decade. The Great Recession obviously has hurt the stock price, but their funamentals never changed. Despite the recession, even the 10-year growth numbers are double digits! These numbers beat 20 of the 21 Financials in the CCC Aristocrat list. Pretty amazing if you'd ask me. The yield of 2.68% is below the sector average of 3.16%, but with these growth numbers, I'm not worried at all. Looking at the valuation of TROW, the numbers are looking very nice. This high EPS combined with a low payout ratio and a low P/E leads me to believe that the stock is currently undervalued. Theres definitely enough room for future growth. I'm new to valuating stocks, so I don't know what a fair price would be, but I am studying this subject. If you own a non Apple smartphone, the heart of your phone is probably manufactured by QCOM. Their Snapdragon processor is widely used in the current generation of smartphones. 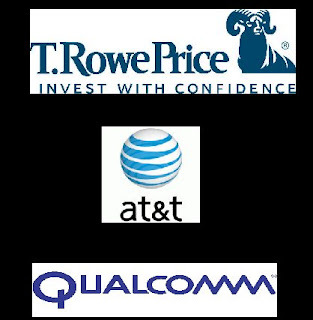 Qualcomm is my first holding in the Information Tech sector. I'm not a huge fan of Facebook, because there is no product to sell. As with MySpace, Facebook could be worth nothing in a matter of a couple of years. Same goes for Twitter. Apple seems to be overvalued to me. Will we keep buying an iPhone every 2 years until they release iPhone 27? I'm not sure. I do think smartphones and other smart products are here to stay, so buying QCOM makes perfectly sense, despite not liking Apple so much from an investor point of view. As with TROW, QCOM has some impressive growth numbers. These numbers beat all the other 17 stocks in this sector for the Contenders section! This amazing deal comes with a 3.07% dividend yield, which is above average. With these numbers, there should be more than enough capital to sustain current dividend payouts as well as a lot of money to be used to growth the relative new company. They have been raising their dividends for 13 consecutive years. After buying TROW and QCOM I had about $40 left in my account. My broker does not support buying fractial shares yet, so I added 1 share of AT&T to my portfolio, as they went ex-dividend at the 8th of July.